Thomas was the son of a count and a relative of both the Emperor of the Holy Roman Empire and the King of France. At the age of five, his parents sent him to the Benedictine Monastery at Monte Cassino to be educated in the hope that he would eventually become the abbot there. In about 1239, the Benedictines sent Thomas to the University of Naples to complete his education. He disappointed both the Benedictines and his family by joining the Dominicans at Naples in 1244. This move was so strongly opposed by his family that they had him kidnapped and held him in the family castle for over a year in an attempt to dissuade him. Thomas persisted, however, and after more studies in Paris and Cologne with St. Albert the Great, he was ordained around 1250. 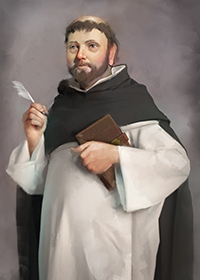 Continuing his studies, Thomas Aquinas became a master of theology. He then moved on to teaching and writing, first in Paris and then at Naples, Rome, Orvieto, Anagni, and Viterbo. It was during this period, from 1259 to 1268, that Thomas began his greatest opus, the Summa Theologica, a work that deals with Catholic theology in its entirety. Although Thomas drew a sharp distinction between faith and reason, he emphasized that the fundamental Christian doctrines, though impossible to establish by reason, are not contrary to reason and reach us by revelation. Nevertheless, he believed that such truths as the existence of God—as well as God’s eternity, creative power, and providence—can be discovered by natural reason. Thomas Aquinas is considered the preeminent spokesman for the Catholic tradition of reason and of divine revelation. His writings are required study for all theological students even to this day. He was canonized a saint in 1323 and declared a Doctor of the Church by Pope Pius V in 1567. St. Thomas Aquinas is the patron of students, schools, colleges, and universities. His memorial is celebrated on January 28. Thomas' message today: Thomas Aquinas was a theologian of unparalleled insight. For hundreds of years, his writings have been the basis for almost all theological study. While not everyone would want to delve into the writings of Aquinas, all Catholics should strive to learn more about the teachings and traditions of the Church. Spend some time learning about the Catholic faith. Check the U.S. Catechism of the Catholic Church, your parish library, or a religious book store to see what is available there.